Last week I received a lovely package in the mail that included this book in it. This is a new book to me, and I was a bit surprised that I hadn't heard of it before. But it definitely sounds interesting and I'm looking forward to checking it out! Ooh nice! Saw this one just recently! Sounds interesting! While I haven't had the best of luck with mermaid books, this one sounds really interesting! Six mermaid heroines...hell yes. I am ready for some mermaid epic tale and this sounds like it is! This is getting added to my goodreads right now. Great pick. 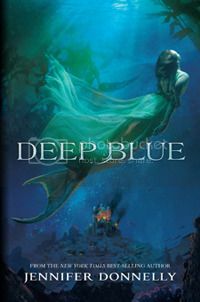 I am not normally a fan of mermaid books but this is Jennifer Donnelly writing it and I adored her book Revolution so I am very curious about this one! And she's switching genres again! Fantastic pick! I am very excited for this one b/c I love Jennifer Donnelly. Northern Light and Revolution are some of my favorite reads! Yes!!! I hadn't heard of this book before, but I saw it at ALA last week and now it is one of THE books I want to read most! Plus, it's Jennifer Donnelly, so just wow! YES! THIS BOOK SOUNDS SO AWESOME!! I CANNOT WAIT FOR MAY TO GET HERE BC THIS BOOK COMES OUT!! Can you tell my level of excitement by all the caps? Hehe sorry!! Anyways, fab pick, Christy! I hope you're having an awesome week so far! This sounds wonderful and I love Jennifer Donnelly's writing. Can't wait to read it!